That was NBC6 chief photographer Mike Zimmer, architect of some of Channel Six’s more daring live shots. He probably had the idea in his mind from the moment he was able to obtain some exclusive video of Cuban refugees in U.S. Coast Guard custody at the old fort. WTVJ’s Hank Tester, preparing to go live from Fort Jefferson in the Gulf of Mexico. 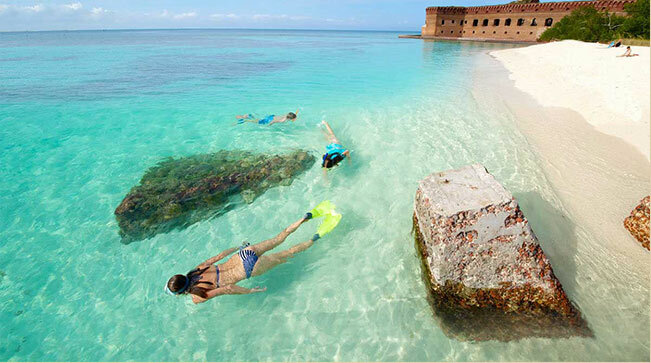 Talk about a “live remote.” Fort Jefferson is 70 miles west of Key West, Fla., at the far western end of the Florida Straits. Remote all right. You can travel there only by private yacht, a couple of tourist catamarans or by seaplane.Fort Jefferson was built to provide protection for American shipping lanes into New Orleans and to anchor U.S. presence in the Caribbean. The 18 million-brick structure was a Union Fort during the Civil War and served as a coaling station at the turn of the 20th century.The U.S.S. Maine recoaled at Fort Jefferson before departing on the ill-fated trip that ended in the massive explosion in Havana Harbor that triggered the Spanish–American War.Anchored on a small spit of sand, the massive structure with its imposing archesis a photographer’s dream. The historic fort’s location plays out in other dreams—Cuban Refugees seeking freedom in the United States. Fort Jefferson is less than 100 miles from the north coast of Cuba.The fort and surrounding keys are the target of human smugglers who, for a big price, drop their cargo on the sandy spits nearby. Once on U.S. soil, Cubans are automatically admitted to the United States. Some come in crude boats, but primarily, it is the smugglers who make the night-time runs to the Dry Tortugas.That was our story: how Fort Jefferson had become an alternative drop-off location to mainland Florida, where Cubans usually attempted to land.Change of PlanOur game plan was to get out to the fort, shoot two stories and bring the material back to Miami to edit. Our second story covered the structure’s $18 million restoration. We took the Yankee Freedom III catamaran to the fort. That gave us a five-hour window to shoot the two stories. Rob Gibson, WTJV operations manager, preparing the satellite gear for the live remote from Fort Jefferson. The U.S. Park Service had it all lined up. Mike and I have worked together for so long, that we just went on what seemed autopilot and knocked out the stories. At the end of the day we did have a few moments to take in the big picture— the sheer magnitude of the fort, the azure water, the red bricks radiating in the spring sun. The whole scene screamed live shot and we headed back to Miami dead set on getting it done.Enter Rob Gibson the NBC6 operations manager who has brought us into the digital age. Rob was really intrigued with the idea, and he had the equipment to get it done. Rob had a couple of cases full of computer gear and two BGAN Hughes 9021 video sat phones—not a lot of stuff, pretty portable. The plan was to use the video sat phones to stream back the live shot and for IFB. Since we had to hit the April 18, 6 p.m. newscast, we had to spend the night at the fort—both the catamarans and the seaplane depart in late afternoon. That was too early for us.We piled into the yellow seaplanes of Key West Cessna. We got to the fort just after 4 p.m., off-loaded the gear and headed up to the northern wall of the fort. Rob laid out his gear, Mike Zimmer, our director of photography, set up his camera, and I practiced my in-and- out.Rob was having trouble. From my nontechnical prospective, it had something to do with the satellite not processing our signal (his actual words for you technophiles—”the 256 kbps portal is open, but there is too much packet loss to support streaming video”).I have learned over the years that there is not much use worrying about the technical side of all this. Let the experts handle it, and Rob did just that. With seconds to spare, he got up a signal, I went live and the rest was caught on videotape.We were pretty proud of our efforts.The shot was a little grainy, but the sunset flooding light into the fort’s parade group was awesome. It was a nice moment for Mike and Rob. The thought of being able to go live when and wherever you want is just amazing. Now we will be just limited to our imagination, and that can take us a long way.We spent the night at the fort, an experience of quiet and stars that seem to hang just above our head. It was awesome and the end of a great day.The thrill and rush of coming on the air and saying “live from Fort Jefferson,” was one of those career moments and it was all due to the hard work and vision of Mike and Rob who know their technology and how to use it.